Within weeks of his Facebook post, images and videos of identical guns started to appear on Twitter and YouTube from across other Syrian battlefields, often in their original crates and with instruction manuals. 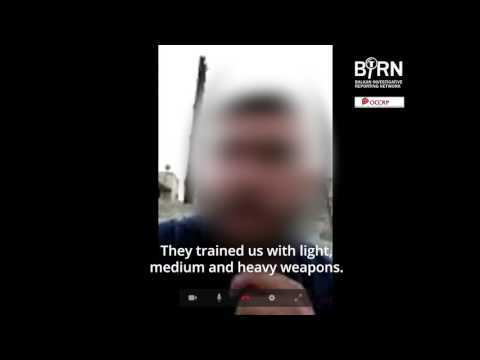 The Training: An FSA fighter explains how he was sent to Saudi Arabia for training. The soldiers gave the gun a nickname – “dushka” – after a similar Soviet-designed weapon known as DShK. “It was light and effective and it was the newest weapon we ever received,” one of them later said. But its distinctive shape and pristine condition soon aroused the attention of online weapons analysts. It was an M02 Coyote – a weapon produced about 1,600 kilometers away in the state-owned Zastava Arms plant in Kragujevac, Serbia. What route did the Serbian weapons take and how did they end up in Syria? Reporters for the Balkan Investigative Reporting Network (BIRN) and the Organized Crime and Corruption Reporting Project (OCCRP) spent a year following the Coyote’s trail. What they discovered was the willingness of the Serbian government to turn a blind eye to the systematic, illegal diversion of Serbian weapons from their “intended” destination of Saudi Arabia to combatants on Syrian battlefields. They found that the powerful weapons were sold to Bulgarian Industrial Engineering and Management (BIEM), a Sofia-based arms broker, for export to Saudi Arabia in 2015 and 2016. From there, the weapons were likely shipped to Turkey, from where arms often cross into northern Syria. Reporters were able to trace the unique serial number of the weapon in the rebel fighter’s Facebook post from the Serbian factory where it was built to BIEM, then to Saudi Arabia, and ultimately into his hands in Syria. The route taken by the Coyote provides the clearest evidence to date of the €1.2 billion (US$ 1.3 billion) arms pipeline uncovered last year by BIRN and OCCRP – a pipeline financed by Saudi Arabia, Turkey, Jordan, and the United Arab Emirates (UAE). In early 2016, about 150 soldiers of the Free Syrian Army (FSA) crossed the border from Syria into Turkey. Handpicked and vetted by Turkish and Saudi Arabian commanders, they were following a well-rehearsed routine that has operated for years. First they spent a week in Ankara undergoing medical checks and obtaining identification documents. From there, they boarded a military plane – an Ilyushin, one soldier said – which took them to Saudi Arabia. Soldiers were told not to use their cellphones. “There were a lot of different officers [at the training] – from the UK, US, Lebanon, Saudi Arabia. … There were American intelligence officers [too]. They are highly experienced and most of them had fought in Iraq,” he said. The Coyote Arrives: An FSA fighter describes how the Serbian-made Coyote machine gun was delivered to Syria. The fighters spent three weeks in Saudi Arabia. It was at this training camp where they were first introduced to the Serbian Coyote. “I saw [a Coyote] with my own eyes in Saudi Arabia, and there the Americans used it for practice,” the soldier said. After the training, the trainees returned to Turkey and then on to the battleground. The Coyote was right behind them. “My gun arrived from Turkey after the training was finished,” he said. He explained that all of his battalion’s weapons passed through the Military Operation Command (MOC) center in Turkey, one of a number of such centers set up in the Gulf, Turkey and Jordan, and operated by Arab, Turkish and Western intelligence agencies. They are used as logistical and training bases. The new weapon was soon deployed by the fighters in their war against President Assad and the Islamic State. In July of 2016, BIRN and OCCRP reporters asked the Serbian Ministry of Defense about the new machine guns that were showing up in battlefields in Syria. A Ministry spokesperson provided a written statement saying that Zastava had sold “a number” of Coyotes to the Bulgarian arms broker BIEM for export to Saudi Arabia – not Syria – in 2015 and 2016. In September, BIRN and OCCRP sent photos of a Coyote in action in Syria along with the serial number of a specific gun in use in Syria to the Serbian Ministry. Initially, the ministry said it could not trace the weapon. After several follow-up emails and calls, a spokesman said that a Coyote with that serial number had been sold to BIEM in 2015. In 2015, BIEM placed a large order with state-owned Zastava Arms, which produces its own version of the Russian AK-47 as well as the Coyote heavy machine gun. While the details of the contract remain confidential, fragments of official information, including Zastava’s 2015 accounts, indicate that BIEM paid €2.75 million ($3 million) for 205 Coyotes. An expert says the figure matches the typical price for such a weapon – about €12,000 ($13,000) per piece. BIEM’s export license for the Coyote deal was granted by the Serbian Ministry of Trade based on a legal document called an “end user certificate,” which guarantees that the weapons will be used by the purchasing party, in this case Saudi Arabia’s security forces. 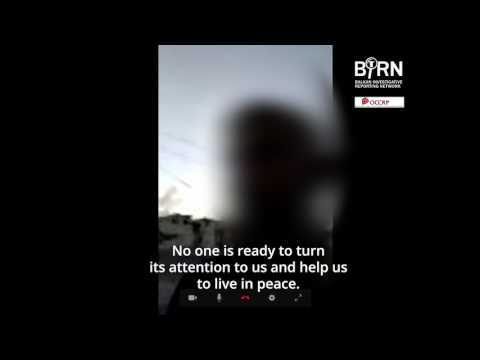 His Hopes: An FSA fighter asks the world for help in ending the war. Although any re-export of the equipment requires Serbia’s approval, the Coyotes seen in Syria appear to have been illegally diverted to Syria by the Saudis. This might not be a surprise to the Serbian officials responsible for issuing arms licenses. Saudi armed forces do not use such guns themselves, relying instead in large part on more modern and sophisticated Western-made weapons. Furthermore, Saudi Arabia has a history of diverting weapons to Syrian rebels. Serbia is required to stop exporting weapons which are likely to be diverted, particularly to war zones and non-state groups accused of war crimes, under a series of regulations: its own anti-arms-trafficking law; the UN-backed Arms Trade Treaty; and to the European Union’s common position on the arms trade, with which it is aligning itself in hopes of joining the bloc. And, in 2013, this is exactly what it did. According to confidential documents from Serbia’s Ministry of Defense and minutes from a series of inter-ministerial meetings, in that year Serbian officials blocked an export license for weapons to Saudi Arabia for fear they might be illegally handed on to Syrian fighters. Yet in 2015, Serbia switched directions and approved the Coyote deal alongside exports to Saudi Arabia of other arms and ammunition worth, in total, €135 million (nearly $150 million). Serbia’s Ministry of Defense, one of the ministries consulted as part of the licensing process, told BIRN and OCCRP in a written statement that the export licenses were approved because they would have a “positive impact” on Serbia’s defense industry. Serbia is not the only country that may have violated international laws. Bulgarians, Saudis, Turkish intelligence, and the CIA – all key players in training Syrian rebels and supplying them with weapons, also likely turned a blind eye to the inaccurate end user certificate as weapons legally destined for the Saudi security forces made their way from the Gulf to Syria. Bulgarian, Saudi Arabian and Turkish authorities did not respond to requests for explanation, while the CIA said it would not comment. The Syrian war has helped Serbia’s arms business flourish. Weapons factories that are working at capacity have added extra shifts or stopped taking new orders to cope with the strong demand. In 2015 Zastava, which produces the Coyote, saw sales grow 34 percent over the previous year to €35.7 million ($39 million). Krusik, another state-owned missile and ammunition producer, saw 73 percent sales growth to €26.4 million (nearly $29 million) during the same time period. “I adore it when we export arms because it is a pure influx of foreign currency,” Serbia’s Prime Minister Aleksandar Vucic told reporters last August. 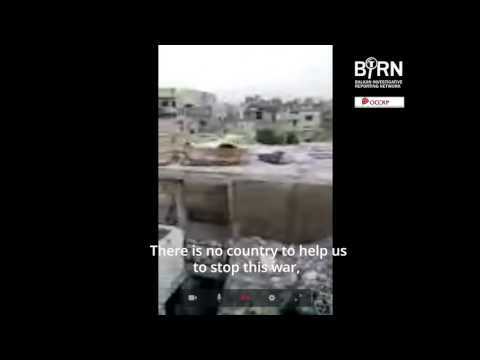 Scenes of Devastation: An FSA fighter reveals the devastation which has befallen his hometown. But not all are happy. Miles away in Syria, dozens of lives are lost every day. The soldier who was at the training told BIRN and OCCRP that he left Aleppo before its capture by government forces, and has now rejoined the FSA. His Coyote is now with another FSA brigade which is fighting ISIS and the US-backed Kurdish forces in northern Syria. Like many of his fellow soldiers, he would like to see the end of the conflict.